F18MC3000 Offer valid while supplies last. Offer expires 11/26/2018. The Titan TP-Pro Alpine massage chair has the most advanced massage technology in the Titan Chair line up. The revolutionary L-Track design will massage your neck all the way down to your glutes and even your thighs. There are many high-end features that make the Titan TP-Pro Alpine massage chair a great purchase for any home or office. The Pro Alpine comes equipped with Zero Gravity, Mechanical Foot Rollers, Air Compression massage, Body Scan Technology, Easy to use Remote, and much more. Inspired by NASA technology, the Zero gravity position is the perfect position to enjoy a massage, aligning your back relative to your thigh at an optimal level of comfort. 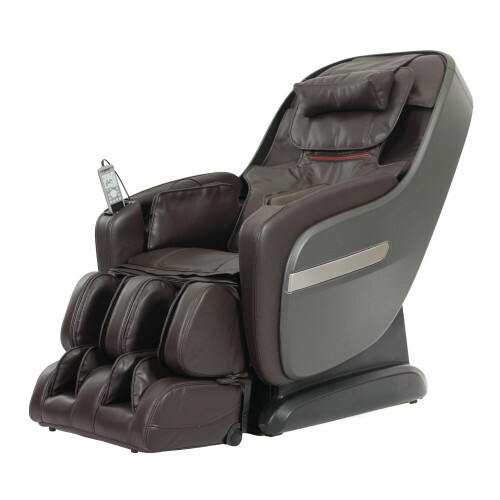 When reclined into the zero- gravity position, the complete weight of your back is virtually supported by the backrest which maximizes the intensity of the massage. There are the stages of zero gravity, the 2nd being more server in pitch, relative to the seat base. This chair defines luxury and is fully automatic to make every movement effortless. The simple to use remote control allows you to operate the foot extension, leg rest, recline of the backrest, and the zero- gravity position.